By, Tiberah Tsehai: “I was in awe of her. 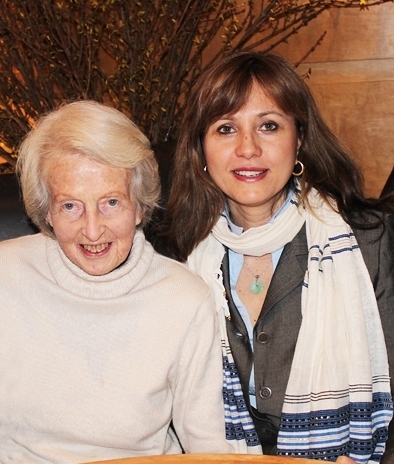 I was so honored to be in her presence,” said Nancy Feldman after meeting Dr. Catherine Hamlin. Nancy is a school nurse from the town of West Orange, New Jersey, with a big mission: raise enough funds for 25 women in Ethiopia who suffer from obstetric fistula receive surgery and make their lives whole again. Nancy has long followed the work of Drs. Reginald and Catherine Hamlin so when TsehaiNY invited her to meet Catherine Hamlin there was no hesitation. After seeing ‘A Walk to Beautiful’ last spring, Nancy was brought to tears and then moved to action. After shock, an immediate sense of having to do something soon followed. Nancy formed a committee and is currently planning a spring gala to benefit Hamlin Fistula USA. The goal is to raise enough funds for 25 women to receive surgery. It costs the Addis Ababa Fistula Hospital $450 for each woman they treat. While Nancy learned of obstetric fistula as a nurse, one of her biggest challenge is that people in the United States don’t know what an obstetric fistula is. One by one she is impacting the lives of others in the same way her life was impacted, by showing ‘A Walk to Beautiful’ during workshops. For more information about the spring gala or to learn more, contact Nancy Feldman at nfeldman16@gmail.com. Thank you for bringing this cause and this incredibly gifted and dedicated physician to light. There truly are angels on Earth. I look forward to supporting this work for years to come. It would be wonderful to request to add this article to the West Orange District website to share the true meaning of compassion and dedication to humanity. Also, to share the caring, compassion, and committment of Nancy Feldman, the best kept secret in West Orange. The Fistula Fundraiser that is scheduled for Monday April 7, 2011 at Messob restaurant in Montclair, NJ should be supported and attended by all of us. this is an event that should have been organized and schuduled by Ethiopians. However, Nancy Feldman a school Nurse at West Orange High School is doing it. The least we can do is show our support and apreciation.